20 posts categorized "Crater of Diamonds"
One man found the perfect last-minute Mother's Day gift for his wife when he spotted a small rock that turned out to be a diamond. "When I told her I was going to find her a diamond for Mother's Day I didn't know I would actually find one," Wendell Fox told ABC News about his find at the Crater of Diamonds State Park in Murfreesboro, Arkansas, on May 13. "I sort of pre-committed so I had to follow through," he said. Fox, 70, and his wife Jennifer, 68, live in Joliet, Montana, most of the year, but as Arkansas natives, the pair knew the storied history behind the state park. "The diamond mine is part of Arkansas history and it's the only one in the U.S." he explained, unaware that the park had been a hotbed for other diamond-seekers in recent months. Fox said he and his wife were walking around the grounds for about an hour and a half "looking for a glimmer" when he noticed the gem. "I was surface looking, walking very slowly and looking very slowly and I saw it," Fox said. "I got down for a closer inspection because I wasn't quite sure what to look for, but as soon as I saw it I thought, 'that's probably a diamond.'" Fox showed the peanut-sized stone to his wife who told him to take it to the Diamond Discovery Center. When Fox pulled it from his pocket to show the employees, "one of the ladies sort of gasped and I just saw this big smile," he said. The staff confirmed that Fox discovered a 2.78-carat champagne colored diamond, the second-largest one registered at the park this year. Fox named his gem "Way Out Yonder" as a tribute to their home in Montana. The gemstone will be made into a pendant for his wife, Jennifer. "We still can't believe that we found it. It was just by the grace of God and love," Fox said. There are those who go to the Crater of Diamonds State Park, armed with shovels and buckets and kneepads and maps to spend the day meticulously digging for diamonds. But the Frederick find is pretty unusual. For one thing, the diamonds are spread out over 37.5 acres of the park. The Fredericks found theirs last week just three feet in front of them. The diamond is pearly white in color and shaped like a triangle. The Fredericks decided to name it "Lucky Diamond." Exactly how much the diamond is worth depends on its clarity, cut, color and carat (the four 4Cs), but it's a safe bet it's worth much, much more than the $16 the Fredericks spent on admission. A Gentry woman found a 2.1-caret diamond (similar to those pictured) Saturday at Crater of Diamonds State Park near Murfreesboro. The diamond is the traditional birthstone for those who were born in the month of April. 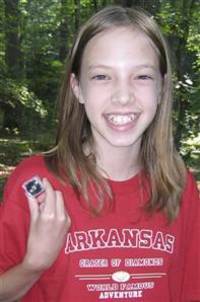 How perfect that Andrea Murphy of Gentry, Arkansas, found a 2.10-carat brown diamond Saturday, April 6 while she and her family visited the Crater of Diamonds State Park near Murfreesboro to celebrate her birthday. According to park interpreter Margi Jenks, Murphy and eight of her family members gathered together at the Crater of Diamonds to celebrate a milestone, her 30th birthday. Her mother, Karen, came up with the idea to visit Arkansas’s diamond site and celebrate the occasion here since the diamond is Andrea’s birthstone. “The square, iced tea brown diamond was a surface find after Andrea had been here for about two hours. At first Andrea thought her find was either a diamond, or some kind of toy. After the park staff verified and registered her diamond, Andrea decided that the best name for it would be the Andrea Birthday Diamond,” Jenks said. The diamond is the 144th diamond found this year by a park visitor, and it is the sixth diamond since January 1st weighing over one carat. The diamond was found in the East Drain area of the field, a 37-acre plowed field that is the eroded surface of the eighth largest diamond-bearing deposit in the world in surface area. It is the world’s only diamond-producing site open to the public. On average, two diamonds are found each day at the park. What park visitors find is theirs to keep. The park staff provides free identification and registration of diamonds. Crater of Diamonds State Park near Murfreesboro, Arkansas continues to be the source of diamonds for the public who have a keen eye and are willing to do a little digging. Every year, heavy machinery is used to uncover new material in the park’s 37 1/2 –acre diamond search area where park visitors can keep the diamonds they discover. On average, over two diamonds a day are found by visitors to the park. The last 12 months have been productive for diamond seekers and the following stories highlight some of those “shiny” discoveries. On November 16, 2008, Rhonda Bankston of Baton Rouge, Louisiana was camping at the park and had decided to try her hand at diamond searching. She had seen a segment about Crater of Diamonds State Park on the Travel Channel’s “The Best Places to Find Cash and Treasures” and was intrigued enough to try it. On her second day of searching, she found a 2.09-carat white diamond that she later had faceted to a 1.04-carat cushion cut shape. Rhonda named her diamond “Dream Angel,” which is appropriate for a gem with exceptional white color and high clarity. Crater of Diamonds had yielded many high quality diamonds and the most famous was the 3.03-carat Strawn-Wagner Diamond found in 1990 that was ultimately cut to a 1.09-carat D color, Flawless clarity, and Ideal cut diamond, which is the highest quality possible when it was graded by the American Gem Society Laboratory. Glenn Worthington has visited Crater of Diamonds State Park for 30 years and has found many diamonds, written a book about the park, and produced a DVD demonstrating how to find diamonds at the park. On April 9, 2009, Glenn was searching for diamonds by dumping buckets of mud over a screen. He had decided to process one last bucket before the Easter weekend when he discovered his largest diamond. The 2.04-carat diamond has a bright yellow color and has a smooth, lustrous surface and an elongated shape. Glenn named his special find “Easter Sunrise” because of its appearance and the timing of his find. On April 28, 2009, Mike Burns of Arab, Alabama, discovered a 5.75-carat white diamond. Mike had traveled to Colorado with a good friend to look for gold but the property owner was not available where they wanted to search. Prior to the trip, Mike’s wife, Linda, had mentioned she would like a diamond for their 20th anniversary and she repeated that comment on the phone when he called from Colorado. She suggested he should get to Crater of Diamonds State Park so he could find a diamond for her. Mike did go to the park and while walking along a wet creek bank spotted a shiny object. After confirming his find was a white diamond, he named his gem “Arabian Knight” in recognition of his hometown high school football team. Time will only tell if Linda gets her anniversary diamond. On October 20, 2009, Royce Walker of Lockesburg, Arkansas was operating a bulldozer for a contractor trenching the Crater of Diamonds State Park search area. As he walked across the search area to give his son, Bobby, a lunch break he spotted something shiny in the dirt. He picked up what turned out to be a 2.93-carat, dark honey brown colored diamond about the size of a pinto bean. The diamond is shiny on one side and metallic looking on the other side with a broken edge indicating it was probably part of a larger diamond crystal at one time. On October 30, 2009, Billy Moore of Murfreesboro, Arkansas found a 3.20-carat white color diamond with a rounded shape. Billy named the gem “The Frosty” because of its rounded, white appearance. Billy is a frequent visitor at Crater of Diamonds State Park. While he has found approximately 400 diamonds in the park during his years of searching but the 3.20-carat is by far his largest find. 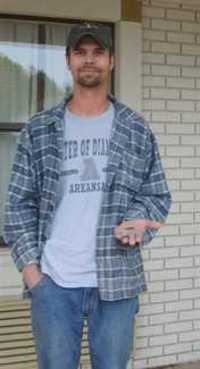 Matthew Smith of Dallas, Texas is one of the latest to discover a diamond at Crater of Diamonds State Park in Arkansas. Along with his cousins from Connecticut, visited the park last week and found a 2.75-carat brown diamond. He named the diamond the Brown-Eyed Beauty. Visitors at the park get to keep the diamonds they find at the 37.5 acre plowed field, the worlds only diamond producing mine open to the public. While visitors at the park find diamonds almost every day of the year, the 2.75-carat find is rare. Perhaps the top authority on Crater of Diamonds is Glenn Worthington who found his first diamonds at the park in the summer of 1978. Glenn has been fascinated by the park every since and has written several books explaining the history of the park and the discoveries there. He just released a new DVD entitled “How to Find Genuine Diamonds in Arkansas,” which is available on his website at www.DiamondsInAR.com. Glenn emailed me this note this weekend that puts this 2.75-carat diamond find in perspective. Here is some news. A week ago, on July 12th, a nine-year-old boy arrived at the Crater with his family. Seven minutes later, he picked up a shiny rock and showed it to his mother. "Is this a diamond?" he asked. "No," she replied because it was really too big and they'd only been there a few minutes. They held onto the shiny pebble for three hours and had it setting on a bucket with other rocks at the wash pavilion. Finally, the young boy's aunt said, "You ought to take that to the Diamond Discover Center and have it checked to see if it is a diamond." He did, and it was. It was a brown diamond that weighed 2.75 carats, and they'd just left it laying around for 3 hours while they searched for diamonds. Funny but true. A nine-year-old boy did better in seven minutes at the Crater than I have done in 30 years of searching. That is the amazing thing about that place. You never know when or where a big diamond will turn up or who will find it. I always enjoy hearing about diamond discovers at Crater of Diamonds State Park in Murfreesboro, Arkansas, the only diamond mine in the world where the public can keep the diamonds they find. However, the most recent article I read was a took some of the shine from a place that has pleased thousands of adults and children who have spend hours searching for the elusive diamond they could take home and show their friends. The investigative article “Arkansas Diamond Fraud” reports on the diamond sales by Eric Blake (see my previous blog article on Eric Blake). Eric Blake and his family visited Crater of Diamonds in October 2007 and supposedly discovered a large number of diamonds. He then created a webpage and sold diamonds he advertised as being from the Arkansas State Park. He also sold diamonds on eBay that were reported to be from the Arkansas “public” diamond mine. However, investigative research uncovered the fact that Eric Blake had purchased diamonds from India prior to his trip to Crater of Diamonds. Descriptions and photos of the diamonds ordered from India matched the weights and photos of diamonds supposedly “found” at Crater of Diamonds. You might wonder why someone would buy diamonds in India and claim they came from Arkansas. The answer is simple, greed. Because of the rarity and uniqueness of diamonds from Crater of Diamonds, shoppers are willing to pay a price premium for the diamonds found in the United States. The Arkansas diamonds are often uniquely formed crystals that often look like drops of glass, unlike the flat, cube or octahedron surfaces typically found in most diamond mines. However, there are some sources around the world, like the Panna Mines in India, which produce diamond crystal similar in appearance to the crystals found in Arkansas. Since the diamonds from India are more abundant than those from Arkansas and do not have the celebrity status of diamonds found at Crater of Diamonds, the price of Indian diamonds can be less than a tenth the price of diamonds from Arkansas. With a ten-fold profit margin, “planting” Indian diamonds in Arkansas was a profitable diamond scam. While I am sure that the justice system and angry victims will take care of Eric Blake, but I do have concern for all the future visitors to Crater of Diamonds. I hope their fun and enjoyment is not diminished by one person’s diamond scam. For all those people who have found or purchased authentic diamonds from Crater of Diamonds, they should take comfort in the fact that they really to have unique and valuable diamonds. Crater of Diamonds State Park remains a treasure chest of diamonds waiting to be discovered. Chad Johnson moved to Murfreesboro, Arkansas from Iowa in February. Unlike most visitors to Crater of Diamonds State Park who are tourist, Chad has been trying to support himself based on the diamonds he finds at the park. He has found about 80 diamonds thus far but Monday’s discovery of a 4.38-carat tea-colored diamond was his biggest find. As is common practice at Crater of Diamonds, visitors sift through dirt to separate out the collectable gemstones and minerals, always with the hope of finding a big diamond. Chad had put his sifting equipment in a locker when he finished digging Saturday but discovered the cube-shaped diamond stuck in his sifter when he started his dig on Monday. While diamonds are mined every day in countries around the world, Crater of Diamonds State Park as the only location open to the public. Since 1972, visitors have been able to keep the gems they discover in the park. The park officials make every effort to help the visitors by plowing up fields to expose fresh soil but it still takes a hard work, patience and considerable luck to find diamonds, especially as big as the 4.38-carat. 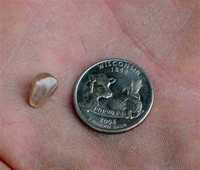 Some visitors go days and even weeks at Crater of Diamonds State Park and never find a diamond but Eric Blake, of Appleton, Wisconsin, found two this week. On Monday, Eric discovered a 1.49-carat and Tuesday he 3.92-carat white diamond. His fiancée, Susan, also found 1.47-carat this week so it has been a productive time for diamond seekers. Like many of the visitors at this unique Arkansas state park, Eric returns several times a year to try his luck sorting through the dirt in search of diamonds and other gemstones. He was carrying a bucket of mud on his way to a washbasin when he set the bucket down to switch hands and spied the 3.92-carat diamond. While most diamonds at the park are found by washing the dirt away from the rocks and stones in a washbasin, many of the larger stones have been discovered while simply walking along the paths. The Crater of Diamonds State Park gets is name from the 83-acre funnel-shaped crater that was formed by an explosion of volcanic gases. Much of the material from the explosion fell back in the crater where years of erosion have increased the concentration of heavy minerals, including diamonds, in the crater area. Today, most of the diamonds at the Crater of Diamonds State Park are found loose in the soil as they are released from the surrounding rocks from by weather and erosion. 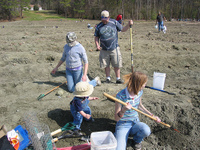 The State Park does what it can to help the diamond production by regularly cultivating the soil to provide “fresh” sources of diamonds for visitors. Prior to 1949, there were numerous commercial mining efforts in the area of the Crater. In 1951, the a portion of the land was leased and open to the public as the Diamond Preserve of the United States and another section opened as The Big Mine. For years, the areas competed for the public’s admission fees until the State of Arkansas purchased both properties in 1972 for $750,000 and created Crater of Diamonds State Park. 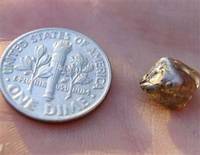 Bill Tryhall, from Albuquerque, was the latest visitor at Crater of Diamonds State Park in Arkansas to find a diamond weighing over two carats. Tryall was vacationing with his two brothers October 10 when he found the diamond. The 2.28-carat diamond was the 725th diamond discovered at the park this year. Crater of Diamonds is the world’s only diamond “mine” open to the public and where visitors can keep the gems they find. In addition to diamonds, visitors can prospect for garnet, quartz, lamproite, jasper, amethyst, and many other minerals. When walking in a field of diamonds, it pays to keep your eyes open and alert. That was definitely the case for Nicole Ruhter of Butler, Missouri who recently discovered a 2.93-carat light-brown colored diamond at Crater of Diamonds State Park. Walking the path that hundreds had walked, she noticed a little shine and a “broken pyramid” shape sticking out of the ground. Nicole, her parents, grandparents, brother and sister has spent the day digging but Nicole’s sharp eyes made her the lucky one. As is the custom for larger diamonds found at Crater of Diamonds, the finder names the diamond. In Nicole’s case, she decided on “Pathfinder Diamond” because of finding it on the path. She plans to keep the diamond for a while and then will probably get it appraised and offer it for sale. The 2.93-carat diamond was the largest of the 332 diamonds found at Crater of Diamonds so far this year. On average, park visitors find about two diamonds per day at Crater of Diamonds State Park, which is the world’s only diamond production area where the public can keep the diamonds they find.